So, as I mentioned here, me and the german couple hired a taxi for a day to take us around the far out tour spots in Beijing. By 7:30am, we were on our way. First stop was the Beijing Wax Works Palace of Ming Dynasty. 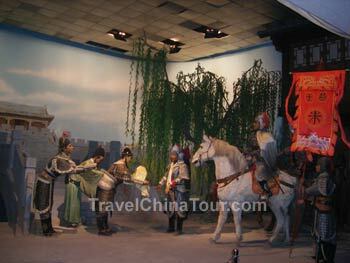 The museum displays life sized wax figures of all the Ming Dynasty emperors, generals, soldiers, and peasants. The museum is laid out in a chronological order, and each section of wax figures portrayed a significant event during the reign of each Ming Dynasty emperor. If you planned on taking photos, the museum makes you pay an extra $10 "photo fee". 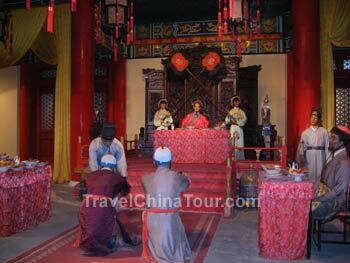 As you enter the Beijing Waxworks Palace, it starts off with the very beginnings of the Ming Dynasty first emperor Zhu Yuanzhang (1328 - 1398), and progresses with each successive emperor. The wax museum ends with the last Ming Dynasty emperor Zhu Youjian (Emperor Yizong). Below are some photos taken inside the Wax Museum. 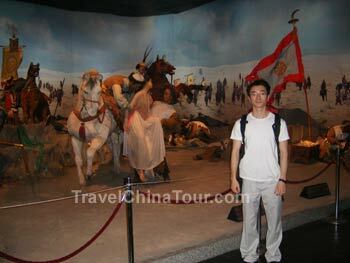 These are life sized wax figures showing various significant events that took place during the Ming Dynasty. I can't post all the photos I took here, but here's a few good ones. Nanjing City to the Yan Troops. In 1449, Oirat chieftain Esen attacked Datong in Shanxi Province. The photo above shows the massacre that took place. This was a depiction of 1570 when the Mongolian Anda tribe was troubled with internal conflict. Pahannachi's fiancee was given to another man by Anda Khan. Pahannachi was furious and fled to the Ming empire. The above shows the banquet the emperor held to welcome Pahannachi. If you're interested, you can read in detail about the history of the Ming Dyansty here.